Karan's close friend Neha Dhupia took to her Instagram handle to post a wish for the twins since she'll be missing out on the celebration. Unless you’re living under the rock, you’d be aware of Karan Johar‘s twins cuteness and as the little munchkins, Yash and Roohi Johar, turn two today, rumours are rife that the ace director will be holding a lavish bash for his bundles of joy at the Taj Lands hotel. While star kids like Misha, Taimur Ali Khan, Innaya Noimi Kemmu and others are expected to turn up at the bash with their parents, Karan’s close friend Neha Dhupia took to her Instagram handle to post a wish for the twins since she’ll be missing out on the celebration. 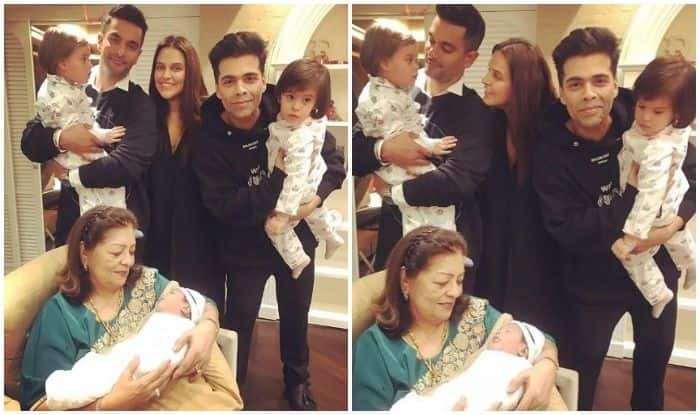 In the pictures that Neha shared with the birthday wish, her actor-husband, Angad Bedi, is seen holding Yash while twin Roohi is held by Karan. While the three parents can be seen twinning in black, Yash and Roohi were twinning in white nightsuits and matching socks. As for Mehr, the cutie pie was nestled in Karan’s mother, Hiroo Johar’s lap. Sharing the absolute love dripping picture, Neha captioned it, “#happybirthday my dearest Roohi and Yash … I still remember the first time we met and both of you screamed out loud … “bbbbaaaaabbbbbyyyyyy”…. I may not be joining you for your birthday celebrations this time as I will be busy … but I promise I ll create havoc with you very very soon… @mehrdhupiabedi” (sic). Twins Roohi and Yash were born via surrogacy on February 7, 2017 and the proud father had announced their entry into the world with his tweet that read, “I am ecstatic to share with you all the two most wonderful additions to my life, my children and lifelines; Roohi and Yash” (sic). Ever since then his industry friends can be seen flocking in to spend some quality moments and unwind with the twins of whom Karan is obviously very fond and can be regularly seen sharing their cute pictures and videos on his Instagram account.